1. Grand Gourmet, the Grand Central Partnership will present the seventh annual edition of this food festival featuring dishes from more than 30 Midtown Manhattan restaurants, Thursday, June 1, 7:00 p.m. to 9:30 p.m., at Vanderbilt Hall in Grand Central Terminal, East 42nd Street at Park Avenue. $75/person (866.468.7619). 2. No. 7 Train Eating Tour, the Institute for Culinary Education will present a dining tour of Queens along the route of the 7 train, Saturday, June 3, 10:00 a.m. to 3:00 p.m. (the class meets at 10:00 a.m. under the clock in the center of Grand Central Terminal). $75/person, bring an unlimited MetroCard (212.847.0770). 3. What We Eat, T Living editor Amanda Hesser will talk with TV chefs and cookbook authors Dave Lieberman, Daisy Martinez, and Rachael Ray, Sunday, June 4, 10:00 a.m., at the CUNY Graduate Center, Proshansky Auditorium, Fifth Avenue and 34th Street. $25/person (tickets at ticketweb.com). 4. The Bar Show, this wine and spirits trade show will take place on Sunday, June 4, 12:00 p.m. to 6:00 p.m., and Monday, June 5, 12:00 p.m. to 6:00 p.m., at the Jacob Javits Convention Center, 38th Street & 11th Avenue. $30-$60/person (800.243.9774). 5. Harmony of Wine and Cheese, Adrian Murcia, fromager and assistant sommelier at Chanterelle Restaurant, will discuss "the fundamentals of wine and cheese harmony, and tips on how to find the right match on your own," Monday, June 5, 6:30 p.m. to 8:00 p.m., at at Murray's Cheese, 254 Bleecker Street. $50/person (212.243.3289, ext. 25). 6. Champagne Gala, the American Institute of Wine and Food will present a benefit event featuring champagnes paired with food, Monday, June 5, 2006.Monday, June 5, 6:00 p.m. to 10:00 p.m., at Venue: The New York Helmsley Hotel Address: 212 East 42nd Street. $300/person (718.229.6565). 7. Mattanza in Manhattan, celebrate the mattanza, a traditional bluefin tuna fishing festival in Sicily, with a four-course dinner, Tuesday, June 6, 6:30 p.m., at Agata & Valentina Food Bar & Restaurant, 1513 1st Avenue at 79th Street. $40/person, reservations required (212.452.0691). A new feature begins today at The Food Section -- "Shopping List," a mini-blog about gastronomic materialism, from food products to cookbooks, gadgets, cooking gear, and everything in between. The most recent post can be found on the left, with all entries at The Food Section: Shopping List. There's even a dedicated news feed (RSS). There was a minor redesign and shuffling around of items to accomodate the new feature, so there is bound to be something amiss in how this site appears in your browser. If something is not quite right (and, better yet, you know how to fix it), or if you have any other feedback, please let me know. So you can't afford Del Posto, but for less than $20, a wind-up version of Mario Batali can be yours. The officially licensed Food Flippin' Mario -- replete with red pony tail, shorts, and orange clogs -- shakes a bottle of olive oil and flips a pan of spaghetti and meatballs (see demo). But, shouldn't it be pici and duck testicles that he's flipping? According to Gearlog, the mini Mario is $15.95 and will arrive in stores after July 15. There's really no good reason to drop $89.95 on equipment for cooking mussels. Toss the shellfish into any old pot along with some onions and white wine, slap a lid on top, turn up the heat, and you're virtually home-free. But, if you have cash burning a hole in your pocket, Staub's Mussel Pot, made of enameled cast-iron, has a beautiful design that evokes the shape of the bivalves themselves. What's more: A strainer inside the pot separates the mussels from their broth as they cook for efficient tableside bread dipping. 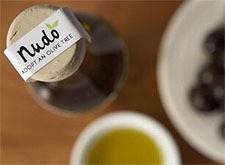 As seen at A Full Belly, adopt one of 881 olive trees from the Nudo olive groves in the Marches, Italy, and for one year you'll receive all of the produce from your tree by mail -- including extra virgin olive oil and olive oil-based soaps: "Imagine dunking your bread in your own oil from your own tree 1,500 miles away on a hillside in Italy." Each tree adoption will set you back £60 British Pounds (alas, there's no shipping outside of the European Union). 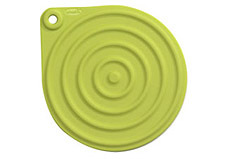 The heat-resistant silicone DiscGo by Chef'n does triple-duty as a trivet, potholder, and jar-opener. It also contains a magnet so that when it's not in use, it may be attached to a refrigerator, stove, or other steel surface for easy storage in even the most space-challenged kitchen.